Below is a list of the most read blog articles in each month during 2017. One interesting commonality for some of the top posts is the fact the ones focusing on investor sentiment tend to gain higher levels of readership. Sentiment is one important market factor we monitor on a fairly regular basis. Secondly, some prior articles seem to remain applicable as 2018 is set to begin. For example, articles like Market Pullbacks Should Be Expected and The S&P 500 Index Is Expensive and Has Been So Since The Early 1990's are certainly timely even today. Our firm's bullish equity stance in 2016 and 2017 has certainly rewarded our clients. We are in the midst of finalizing our Winter Investor Letter which will contain some of our firm's thoughts on the coming year. Four trading days left until the calendar turns to 2018 and one will be able to determine the list of stocks that will comprise the Dow Dogs of 2018. The Dow Dogs were laggards in the first half of the year, but have made up significant ground in the second half of 2017. To date the Dow Dogs of 2017 have outperformed the S&P 500 Index on a total return basis due to the Dogs higher dividend yield. 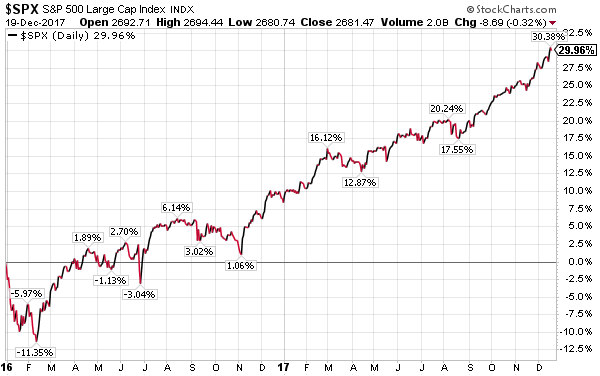 However, the Dogs of the Dow have underperformed the Dow Jones Industrial Average Index on both a price only and total return basis. The best performing Dow stock that is not included in the Dow Dogs this year is Apple (AAPL) and the stock is up 51.1%. As of Friday's close both Boeing (BA) and Caterpiullar (CAT) will drop out of the Dogs for 2018. The two holdings in the running for inclusion in next year's portfolio are Procter & Gamble (PG) and General Electric (GE) with dividend yields of 2.99% and 2.74%. respectively. One of my more regular topics that I write about on the blog from time to time is an update on sentiment measures, both individual and business. Sentiment might be viewed as the third leg of a stool, with the other two being the economy and business financial health or earnings growth. 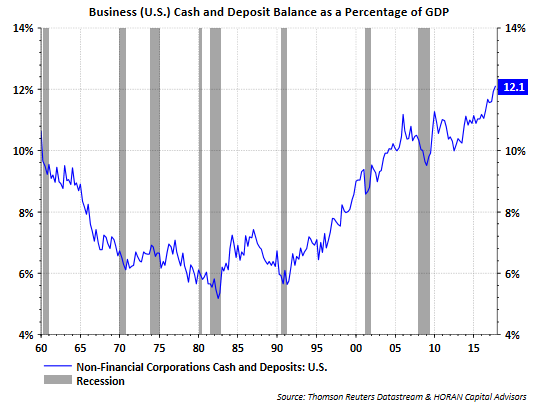 Without positive sentiment from businesses and investors, the economy is more likely to see lackluster growth. 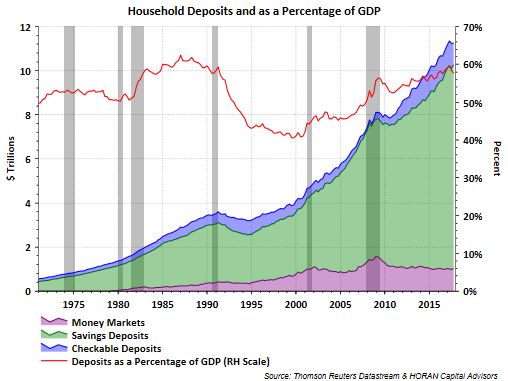 What got me to thinking about whether optimism is too high or not was a recent post by Josh Brown whose blog is titled The Reformed Broker. It seems a day does not go by where the market's valuation is a front and center topic of discussion. 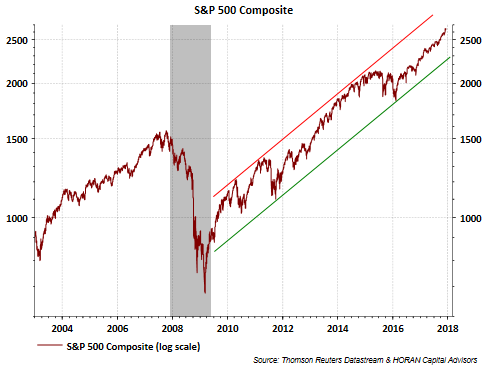 Suffice it to say that I believe, and have written as such recently, that the market does not correct simply because it may be trading at an elevated valuation. Although market declines or pullbacks have been few and far between, when the next pullback occurs, a factor in the the magnitude of the decline will likely center on the market's valuation. 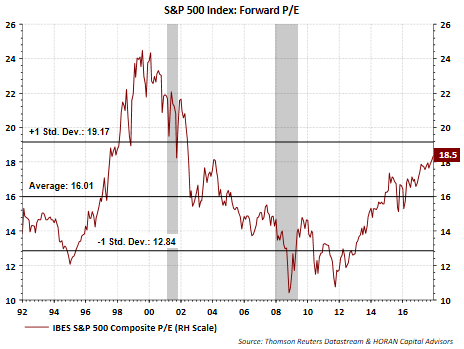 The below chart shows the current market P/E where the earnings are based on the 12-month forward earnings estimate supplied by I/B/E/S. Certainly the P/E is elevated at near a +1 standard deviation level, still the current P/E is quite a bit lower than the technology bubble valuation peak of near 25 times earnings. Overall earnings growth will be important for the equity market to generate respectable returns in 2018. With passage of a tax reform package nearing realization, companies will benefit from the decline in the maximum corporate tax rate. As an example, tonight FedEx (FDX) reported earnings and noted in the conference call that a lower tax rate will add $.85 to $1.00 to per share earnings. This represents an earnings boost of 8% based on currently expected May 2018 earnings of $12.45 per share. What the tax bill does for many companies is provide an earnings benefit that will result in a reset of the market's valuation to a lower level. The result is the market's valuation is closer to its long run average of 16 to 17 times earnings. 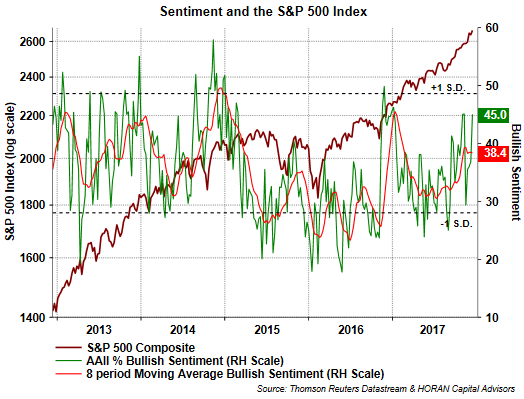 Today the American Association of Individual Investors reported results of their Sentiment Survey for the week ending 12/13/2017. The report shows individual investor bullish sentiment jumped 8.1 percentage points to 45.0%. Most of the jump in bullish sentiment was a result of a 6.1 percentage point decline in bearish sentiment. 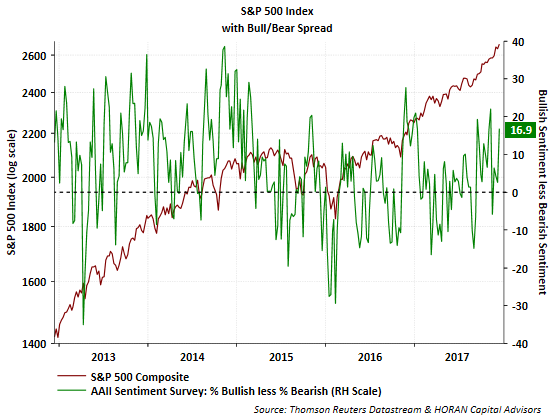 This has resulted in the bull/bear spread widening to 16.9%, the third widest spread in 2017. As I have noted in prior sentiment updates, the survey results can be volatile and the 8 period moving average removes the weekly volatility. Additionally, the sentiment measures are contrarian ones and are most useful when they are at their extremes. The current report is not at an extreme level; however, it is elevated and worth paying attention to as the market continues to move higher and exhibit a low level of volatility. Sentiment for both consumers and small businesses continues to soar. 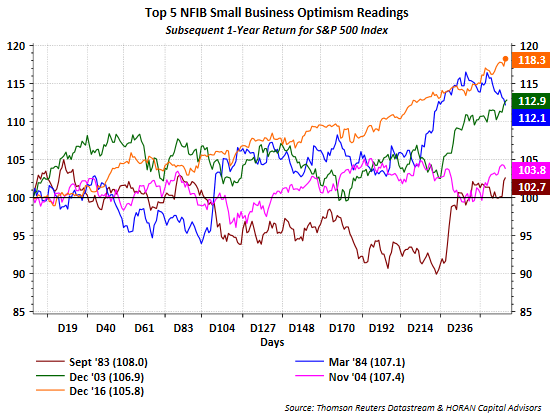 Today the NFIB Small Business Optimism Index was reported at 107.5. I highlighted the surge in consumer sentiment at the end of November. 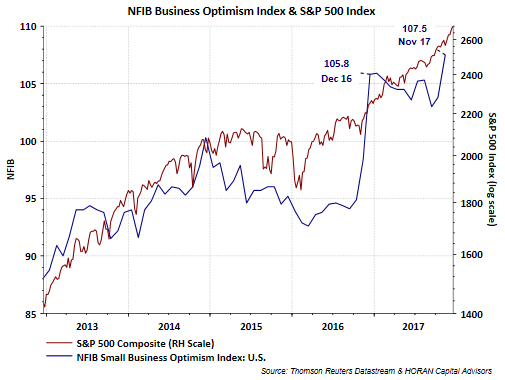 "Not since the roaring Reagan economy has small business optimism been as high as it was in November, according to the National Federation of Independent Business (NFIB) Index of Small Business Optimism, released today." The number of owners who said it’s a Good Time to Expand rose four points. Inventory Plans increased by three points. Actual Earnings Trend moved up two points. The significant improvement in sentiment, especially in business sentiment, has been a common theme for the last year. 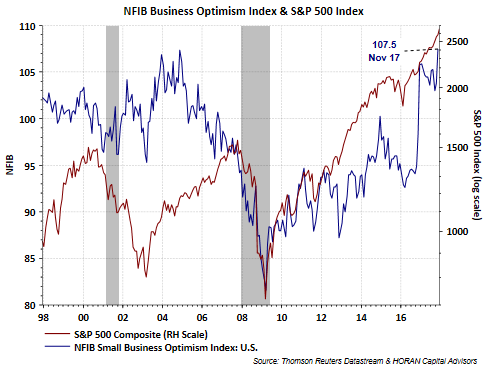 NFIB's report on December 2016 small business optimism saw one of the Index's largest increases. Below is a chart tracking the market's performance since NFIB's last five highest readings from December of last year. This year's market return has been the strongest. Sentiment is an important part of investing psychology. 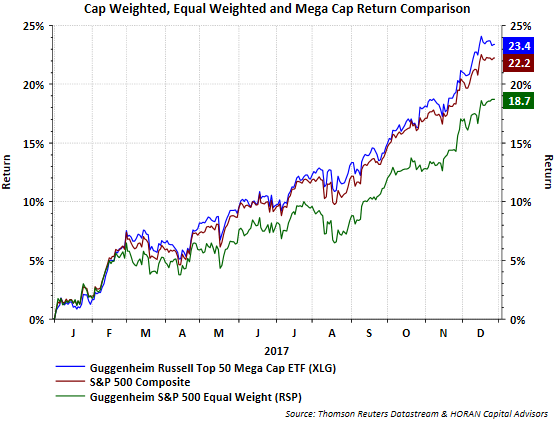 With both consumer and small business expressing high levels of optimism, it is not surprising equity returns have been as strong as they have been this year. It seems like an eternity since the S&P 500 Index experienced a pullback of more than 5%. In fact, the last greater than 5% pullback occurred over a year ago during the period of June 8, 2016 to June 27, 2016. This lack of downside volatility has taken place during a nearly uninterrupted increase in the market that began in February last year. 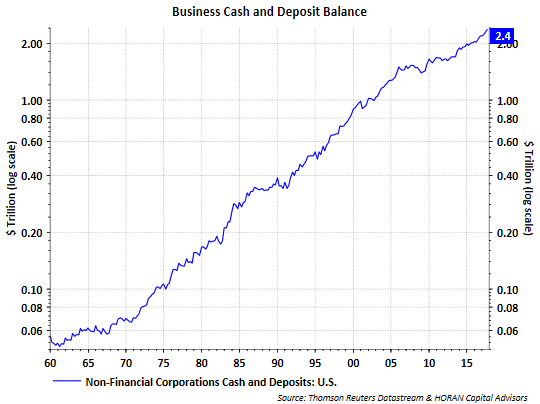 Additionally, the market advance since the end of the financial crisis looks remarkable as well. Little or no downside volatility might be understandable if the equity markets were trading sideways this entire time; however, that has not been the case as can be seen below.